Gosh, it has been a very long time since the last post here… In the gap, I’ve started a part-time barbecue business. Fun stuff! It’s called Egghead’s BBQ & Grill. But this post isn’t about Egghead’s… it’s about some serious freaking chicken! Although most of what I do with Egghead’s is traditional southern barbecue (whole hog, brisket, etc. ), lots of the folks I cook for also want chicken. I have a Paprika Chicken Thigh thing that is tasty and that I use a lot, but I’ve been wanting to expand the chicken horizons, as it were. In my barbecue travels (yes, I can actually take tax deductible business trips to research barbecue now!) I’ve noticed a lot of “half chicken” menu items, so I figured that was a good place to start. I get a whole chicken, and cut it in, well, half. It’s not terribly complicated if you have a big knife… ahem… and remember to cut out the backbone. Sometimes it is easier to do this with shears, but I like the knife. I cut through the breastbone, then open up the cavity and cut down each side of the spine. Remove it (save it for stock, or whatever you do with chicken bits). Then, some simple seasoning. I make a little mixture of kosher salt, black pepper, smoked paprika, onion powder, garlic powder, and cayenne pepper. You can use whatever ratio you like, I go with 3:3:3:2:2:1 respectively. Keep in mind that there are three teaspoons to the tablespoon, and the ratio makes a little more sense. Okay, so chicken cut in half, backbone out, each half seasoned well on both sides. I just built a steel fire pit for my Egghead’s adventures (it’s 4 feet by 6 feet, 2 feet tall, to accommodate lots of whole pig! ), and I like to play around with it even for small batches. But you don’t need a fire pit… any charcoal, lump, or wood fire in a grill-like enclosure will do nicely. I decided to also char up some corn on the cob and a few sliced peaches (actually found some tree-ripened peaches!). Here we have the starting arrangement on the grill. The racks slide back and forth, so it’s easy to control how direct the heat is. Although all the picture shows are the charcoal briquettes, there are a few fist-sized chunks of hard wood in there, too (two chunks of apple, two chunks of pecan), because, well, because I love smoke! I start the chicken halves skin-side down to make sure they get nice and crispy! There’s all sorts of debate about how to grill corn. Some folks suggest soaking the whole ear, husk and all. Some folks suggest removing the husks and grilling it “naked” for maximum char. Personally, I take a middle approach. I remove most of the husks, but leave enough to still cover the cob. This lets me still get char on the kernels, but also means it won’t burn to a crisp if I leave it on a little too long… yeah, distractions happen! After a while (in this case it took about 20 minutes, but your grill may work differently than mine) the skin will have turned a nice golden brown. This is the time to flip the chicken over and add the peaches! 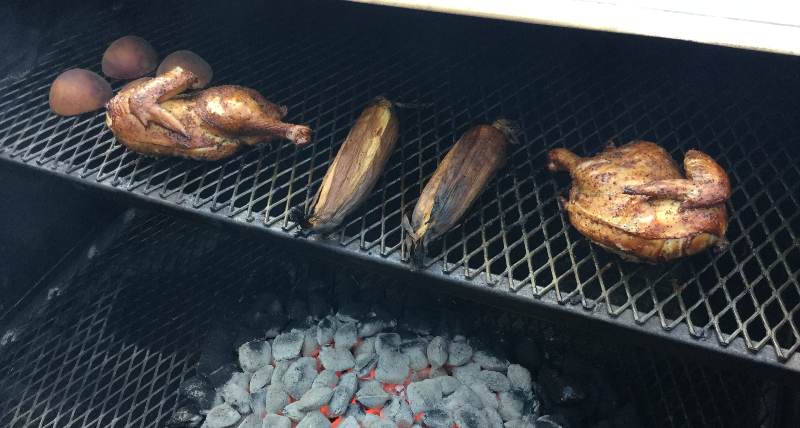 Note the nice color on the corn, too… not burned, but getting plenty of heat and smoke. Hmmm… chicken skin… is there anything it can’t do? 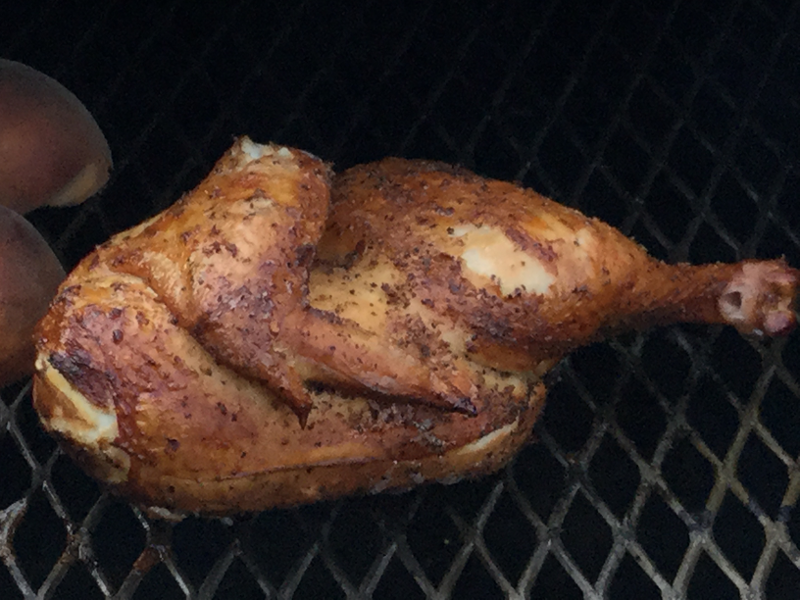 As the chicken continues to cook, I like to rotate it every so often on the grill (about every five minutes) to make sure it is heating evenly. This also lets me keep tabs on the internal temperature (I don’t know what I’d do without my ThermaPen). Once the chicken has reached a safe internal temperature (165F is what I go by, and I check it in a few spots, since the halves are relatively large), it’s time to flip it again to get the final color and crispness on the skin. Then, all that’s left to do is plate it up and chow down! Oh my! Time to dig in! 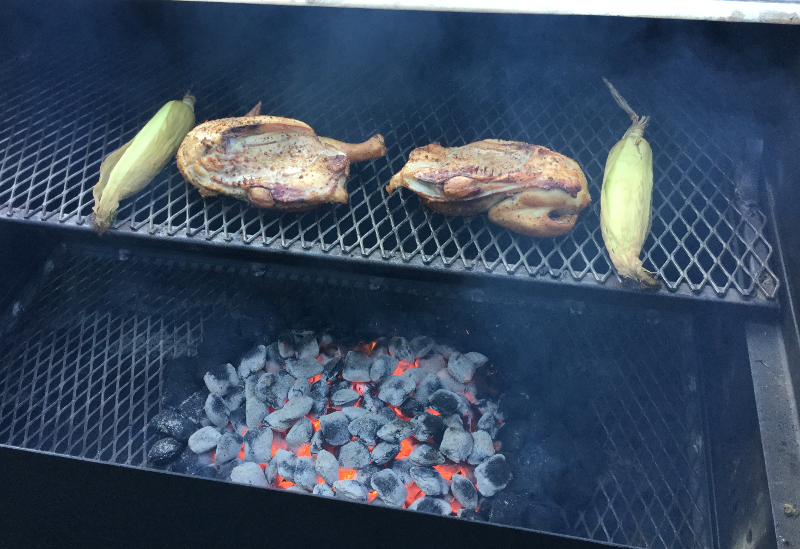 Sakes alive… crispy, salty skin… super moist meat… smokey goodness on the corn… sweet charred peaches! Wah! I’m getting hungry all over again! I like to dress the corn with butter (duh), but also a little lemon or lime juice, followed by salt and pepper. Alternately, you can make a very simple chili-lime mayo (just add a little lime juice and chili powder to some mayonnaise) and spread it on the corn for super yumminess. The peaches? I don’t put anything on them. Although I’ve heard that a little vanilla ice cream is quite tasty on top, if you’re into that sort of thing. There we are. 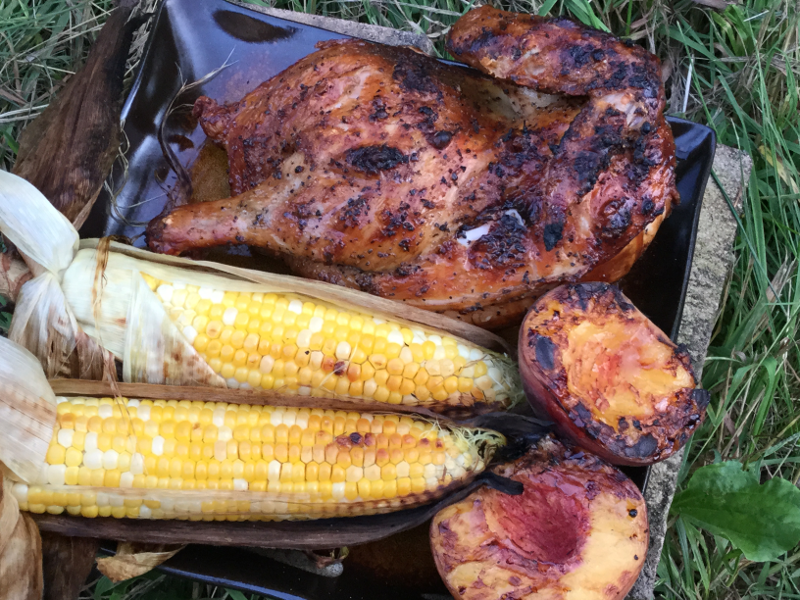 Pit roasted chicken with grilled corn and peaches. Cheers!